Is your eCommerce website scaring your visitors away? Or maybe they stay around, but are then left intimidated by an unwieldy purchasing process. How do you know this is happening? And, more importantly, how can you prevent it? I understand this conundrum. After all, I have been involved in rolling out eCommerce websites to new international audiences. Setting up a successful eCommerce website that smoothly transitions your prospect though the buying journey is not simple. To be successful, you need to take a step back and see things from the customer side of the equation. Read on to understand the 3 phases any customer will pass through on their path to purchase on your eCommerce website. From entering the website, exploring the content, to making the purchase, it’s all covered. For each phase, you will learn the specific actions you should take to ensure a smooth customer journey that transitions visitors into buyers. A new visitor lands on your website and instantly presses the back button. How could this happen? Let’s consider the steps you can take to avoid this problem. Take some time to understand your typical visitors and their expectations. Consider the main points of entry. From where are visitors entering your website? Is it via social media, search, or a direct link? Check Google Analytics to find this information. Consider what type of people you are attracting to your page. Google Analytics is also a crucial resource for finding information about visitors to your website. Are you attracting the right kind of visitor? Does their behavior indicate that they are strong prospects for buying your product? If not, how can you adapt your website to attract the right type of visitors? Is your eCommerce website set up to meet their needs? With that in mind, let’s consider the first-time entry experience. How can you make a positive impression on a new visitor to your eCommerce website? Consider which pages first time visitors are landing on initial entry to your website. Is it mainly your blog posts or your homepage? If you use an online ad, ensure you direct them to a webpage that delivers on the promise in the ad. Don’t send a prospect who clicked on an ad to access a free trial to a generic homepage showcasing all your content. Instead, send them to a dedicated free-trial landing page. Consistency isn’t just important for messaging; it’s also crucial for branding. Make sure the page they land on is consistent with the page they came from in terms of brand voice and design. Doing so will help you make a lasting impression with your brand. Provide helpful links to other areas of your website. Featuring related content at the end of each blog post is a good way to direct visitors to other areas of the website. Put a ‘start here’ button on your menu and link it to a page that will help new visitors understand what your website is about and funnel them to key areas of your content. Your eCommerce website should be easy to navigate so visitors can find the information they need. Browsing competitor websites is a useful process to identify key areas that users expect to find on an eCommerce website (i.e. about page, product pages, contact page, FAQs). If you are attracting a large international audience, make it easy to navigate the different country sites with a country top level domain. Flags provide an easily recognizable visual representation. What’s the next step in the customer journey? Are you giving visitors a reason to return, or are they leaving never to be seen again? Let’s consider this in more depth in the next section. Your prospect has entered your website and found the information they need. How can you retain their interest to stay on your website and give them a reason to return later? You need to provide a clear journey for visitors to follow. Do you know the typical path your customers will take? Here’s how to discover it. First, complete buyer personas for each of your core customer groups. Not sure how to create an effective buyer persona? Mary Shaw offers some great advice on how to create effective buyer personas for your website. 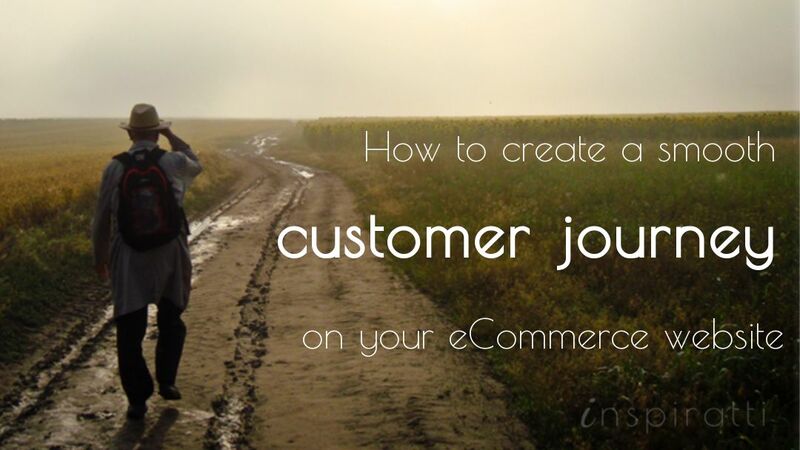 Then create customer journey maps for each buyer persona. Getting to grips with the typical path of your customers will empower you to better meet their needs. 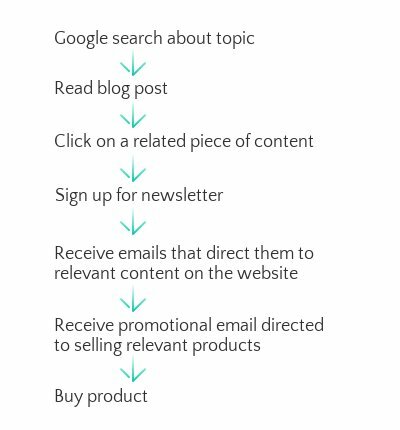 Here is an example of a common customer journey for an eCommerce website. As visitors browse through different sections of your website, they expect to encounter a consistent branding. Inconsistency is fatal. A consistent brand voice across all pages on your website helps create a relationship with your audience. It builds the necessary trust so the prospect is ready to buy. 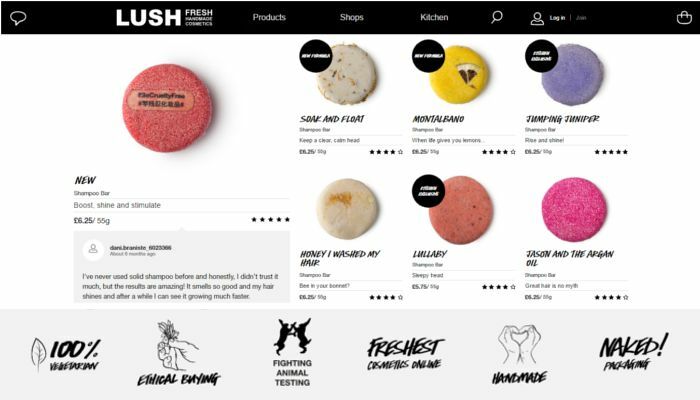 Lush uses a handwritten typography and a personal conversational tone to support their brand mantra of “fresh handmade cosmetics”. Their energetic brand personality is conveyed throughout their site from their brave product names to bold images. Consistent branding goes beyond writing. You need to adopt a consistent design that shows a similar look and feel across your website. Whatever page a visitor lands on, your brand should be instantly recognizable. Consider the colors, typography, and imagery you use. Are they consistent? Do they support the message you are trying to convey through your brand voice? If you have different eCommerce sites for different regions or countries, the question of consistency is more complex. For example, if you choose fresh green to convey your dedication to sustainable practices, this doesn’t translate well in some South American countries where it symbolizes death. More importantly, how can you translate your website so that it conveys a consistent brand voice across your local language sites? Google Translate is not a wise approach. Recruiting a local language expert would be preferable, though this can also be expensive. Providing relevant content can further reinforce your brand message. Used strategically, it will also move prospects smoothly along the path to purchase. Feature interesting and useful content relevant to your ideal buyer persona. Content should also be relevant to the purchase and help move them along the customer journey. Different types of content play unique roles in different phases, from awareness content to conversion. You can use content to answer frequently asked questions or alleviate common objections to purchase. For example, McDonald’s has used video content to answer common consumer questions regarding misconceptions around food preparation. Providing relevant content means consumers can access the information they need at a suitable hour in their local time zone. 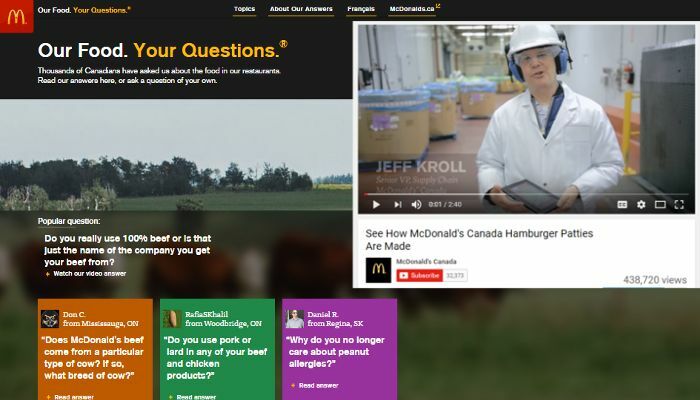 McDonald’s Canada provides answers to common customer questions and concerns through a dedicated site and content on their YouTube channel. Do you need to add locally relevant content to your website, or is it sufficient to have a blog directed to all visitors globally? The answer: It depends. Would your target market expect content to be in their local language? Would this prevent them from purchasing? Consider the type of person you are targeting and the product you are selling, and if the investment in producing the additional content will be worthwhile. Is there a smooth transition between different marketing touchpoints? Take time to assess the interaction between content on your website and your email and social media channels. For example, if you have a newsletter sign up on your Chinese specific website, ensure the newsletter content follows through and is relevant to them in terms of language and culture. If you have a globally-orientated newsletter, make that explicit in the sign up form on your website. You have retained prospects’ interest through lots of helpful content and a great brand. You now need to ensure a smooth buying experience that turns first-time buyers to repeat buyers and even brand advocates. Let’s consider how to do that in the next section. At this stage, you need to present a tempting offer and demonstrate why you are different. Showcase the key features and unique selling points of your product. How is your product different from competing products on the market? Whether it is a unique feature or excellent customer service, ensure this is clearly demonstrated. Make it easy for consumers to view and select different product options. If you offer different colors, styles or sizes, ensure those are easy to view and select. If you are selling a premium product, showcase high quality with close-ups of the product. Prada uses images to showcase the quality stitching and show their products from different angles. For their boxes of chocolates, Hotel Chocolat gives a description of each chocolate supported by close-ups of each chocolate. Feature reviews and testimonials to boost trust and reassure prospects they are making the right purchasing decision. Include unedited descriptions and real names and photos where possible to boost authenticity. Provide exceptional customer service. This does not necessarily need to be a drawn-out process. A FAQ page is a common feature on many eCommerce sites, and many users look to these pages for quick answers to common questions. A more interesting approach is to use content to answer common customer questions (see the McDonald’s example above). If your product requires more hands-on support, live chat apps provide a convenient option for consumers whilst still cutting down on costs. Use Google analytics to determine from where most visitors are accessing your website. This can help you decide the best opening hours for live chat. Consider outsourcing via freelance sites if you are having difficulty meeting needs of different time zones and languages of your core audiences (Kissmetrics). Ensure your pricing and promotions reflect local market realities. Check pricing of local competitors. If your pricing is higher, can you justify this higher price point by adding more value? Consider product quality, level of service, etc. Although sales promotion tactics such as temporary price reductions generally translate well across international markets, take care to assess the sales tools you plan to use in the legal and cultural context of each country. This is a common stage for visitors to drop out. Watch out for these frequent mistakes. Make the buying process simple. Avoid lengthy forms requiring user names and questions unrelated to the purchase. Only request the necessary details, such as name, email and delivery address. Accept payment methods that align with local payment expectations. In most countries, credit cards are the main method of payment. You still need to deliver an exceptional post-purchase experience. Confirm details via a personalized post-purchase email. Set up automated transaction emails that are triggered following the purchase of a product. The email should contain important details about the order personalized to each buyer, including confirmation of when and where the product will be delivered. Ensure you provide any necessary information on how to use your product and encourage them to get started. This is especially important if your product requires recurring payments. No use= no benefit= no future purchases. Carry on the customer journey by emailing them about offers on related products and interesting content to tempt them back to your website. You’ve put a lot of work into attracting your newly acquired customer and helping them transition through each stage of the customer journey. So, what next? You need to continue to deliver an amazing experience. 13% of unsatisfied customers tell 15 or more people if they are unhappy. And 91% of unhappy customers who are non-complainers simply leave (Esteban Kolsky). On the other hand, delivering an amazing customer experience will help transform first-time customers into brand loyalists. As these customers share their positive experiences, this attracts more new customers to your business. Companies that have transformed the buying process from a mere purchase to a user-centered experience are winning in customer retention. And revenue. Are you going to join them? How will you deliver a remarkable experience at every stage of the customer journey? Share your thoughts in the comments. This site is great, very great and also full of great content. Useful information. Very interesting topic, outstannding post.I bookmarked it. Hello very nice website! Thasnk you for this specific info!